As its name implies, in paired comparison scaling, a respondent is presented with two objects and asked to select one according to some criterion. The data obtained are ordinal in nature. Respondents may state that they shop in JCPenney more than in Sears, like Total cereal better than Kellogg’s Product 19, or like Crest more than Colgate. Paired comparison scales are frequently used when the stimulus objects are physical products. Coca-Cola is reported to have conducted more than 190,000 paired comparisons before introducing New Coke.? Paired comparison scaling is the most widely used comparative scaling technique. The most common method of taste testing is paired comparison. The consumer I asked to sample two different products and select the one with the most appealing taste. The test is done in pm ate. either in homes or other predetermined sites. A minimum of 1.000 responses is considered an adequate sample. Ocean Spray North America’s top producer of bottled and canned juices/juice drinks. makes extensive use of taste tests in developing new products. Respondents are asked to sample new drinks presented in pairs, evaluate them on taste and flavor. and choose the one they like more than the other. Taste tests showed that several consumers preferred white cranberries to the strong. tart taste of red cranberries. Which cola drink would be the most popular among your friends in a taste test? Develop a scnpt for testing for preference between two cola drinks: Coke and Pepsi. Make sure the drinks are chilled to the same temperature and poured into three groups of identical cups. Each person will select a cup from the first group. taste the cola, eat a cracker, and take a swallow of water. Repeat this when tasting from the second and third groups. (The first group might be Pepsi, the second group Coke. and the third group Pepsi.) After tasting from each of the three cola sample groups. have the respondents complete the survey form you created. To avoid a biasing effect from the order of presentation of the samples. it will be important for half of the respondents to have a rotated order of presentation: The first group Coke. the second group Pepsi. and the third group Coke. Conduct the taste test on 30 respondents/students. 1. How many respondents correctly identified the two identical samples of cola? 2. Of those who correctly identified the two identical samples of cola. which cola was preferred: Coke or Pepsi? 3. Of those who correctly identified the two identical of cola. how many had no preference between Coke and Pepsi? 4. In sum, who would you say is the winner in your taste test: Coke or Pepsi? Or. is it too close to tell? After paired comparisons. the most popular comparative scaling technique is rank order scaling. In rank order scaling. 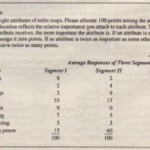 respondents are presented with several objects simultaneously and asked to order or rank them according to some criterion. For example, respondents may be asked to rank brands of toothpaste according to overall preference. 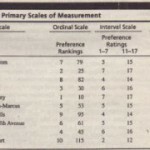 As shown in Figure 8.4. these rankings are to apically obtained by asking the respondents to assign a rank of I to the most preferred brand, 2 to the second most preferred, and so on. until a rank of /I is assigned to the least preferred brand. Like paired comparison. this approach is also comparative in nature, and it is possible that the respondent may dislike the brand ranked I in an absolute sense. Furthermore. rank order scaling also results in ordinal data. See Table 8.2, which uses rank order scaling to derive an ordinal scale. Finally. under the assumption of transitivity, rank order data can be converted to equivalent paired comparison data, and vice versa. Figure 8.3 illustrated this point. It is possible to derive an interval scale from rankings using the Thur stone case V procedure. Other approaches for deriving interval scales from rankings have also been suggested. !” The following example shows how rank order scaling is used to determine the world’s top .